Hello lovely ladies! As promised to everyone who follows me on twitter and instagram, here's a super fab haul. First up is Sephora. I finally bought the Too Faced Natural at Night Palette. I was hesitant for a long time to get this one since it reminded me so much of the UD Naked Palette and I was also considering buying the Lorac Unzipped Palette but Too Faced won me over in my dilemma. I also got the Charlotte Ronson All Eye Need Eyeshadow Quad in Angela which was on sale that time for only $10. A great on the go smokey eye palette. I also found a limited time code for a deluxe sample of the BECCA Shimmering Skin Perfector. For Christmas, I've been telling my mom to just give me a gift card for Sephora but instead she gave me a $50 gift card to Macy's as one of her gifts to me. I would've preferred a Sephora gift card just thinking about all the other beauty brands and the points but no biggie, I still have my eye on a few items that I wanted from Macy's... namely MAC. I ended up getting two MAC lipsticks and the much coveted, new Urban Decay Naked Basics. 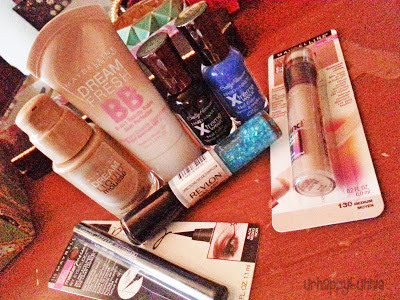 Most of my purchases in Ulta were for the package I''m sending to my good friend, Jill of Lipstick Traces. I only bought a few items for myself and two of them were backups. I bought a backup of my favorite lipstick ever - Revlon Coralberry. This is one of my go-to, everyday lipstick along with MAC Brave (which I lost but thanks to my cousin Rina, she repurchased it for me while she was here in NYC for a visit). The other backup was of the NYX Super Skinny Marker. I also got another Revlon lipstick in Peach Me and two of the NYX powder blushes that I'm slowly trying to collect; Rose Garden and Peach. And finally I will get to try one of the famous Real Techniques brushes by Samantha Chapman which is the Expert Face Brush. Very nice haul! I love the lipsticks, nice colours. Ooh now I want to go shopping for new makeup. The Too faced palette looks good! And the blushes too :) Reviewwwws!